Brad Little: Little's pre mission pep talk to Preston describing what he expects of his protégé "... a 1st class all American hero with his heart & brain wired together cooking full tilt boogie for freedom & justice!" Get some advisors from Ft Hood, Mr Director! 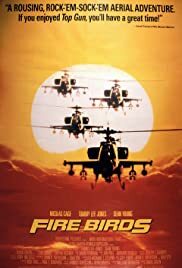 Firebirds suffered from the same problem many military movies suffer from. The writers knew exactly squat about the subject matter. This movie had potential to be really excellent. Nick Cage and Tommy Lee Jones are two very good actors. However, they had crap to work with. The first problem was Apache pilots are a completely different breed than fighter jocks. They were badly portrayed. Sure, they are cocky and arrogant, but those "macho" lines were soooo corny. No self-respecting rotary wing aviator would be caught dead spouting that garbage. Secondly, the helicopters were shown fighting jets and other helicopters. That's like trying to win the Indy 500 in a Yugo or portraying Schwarzanegger as a ballet dancer. Sure its vaguely possible, but no sane person tries it. Finally, Sean Young, while very attractive was not the right person for the role of Billie. All in all, Fire Birds had the right elements and the concepts, but they were jumbled together badly and handled wrong. Leave it on the shelf and get Full Metal Jacket or Saving Private Ryan and see a military movie done right.